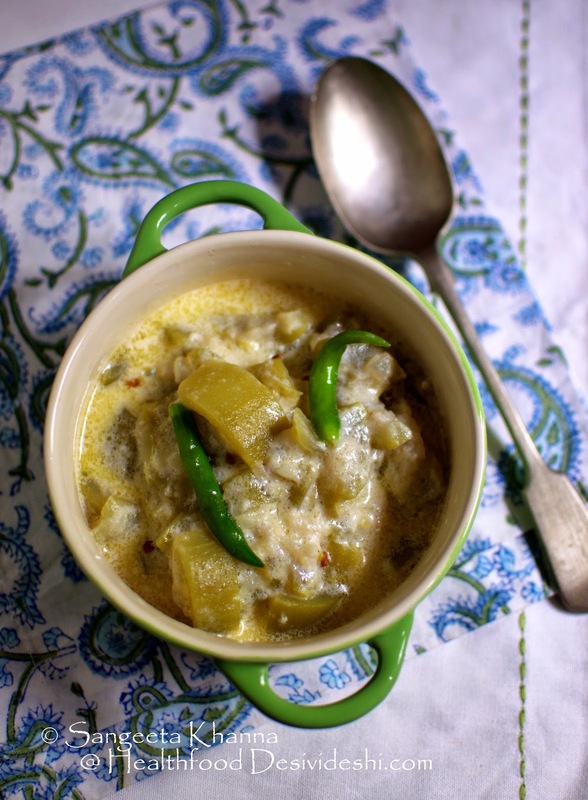 Bottle gourd is Lauki in Hindi and it is one of my favourite vegetables. 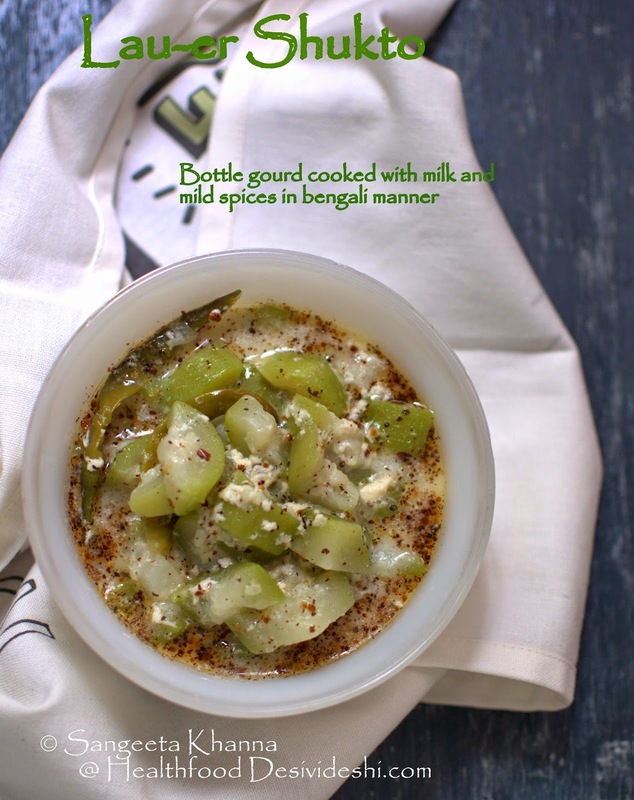 Tender bottle gourd is a delight to cook and eat in summer days and I try and include loads of this gourd for my everyday meals. 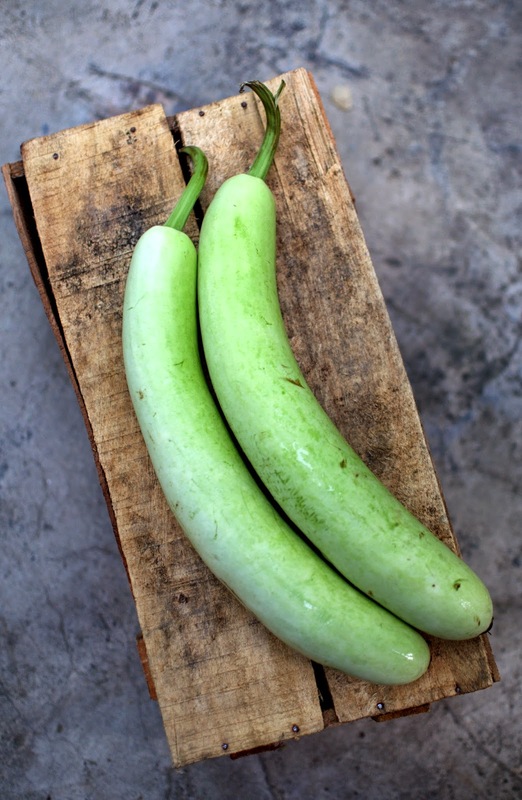 Finding tender bottle gourd can be cumbersome if you don't know how to choose the tender ones, check this post if you want to know how to choose tender lauki for better tasting lauki ki subzi. Even for this lau-er shukto the tender lauki is best to use. If you are stuck with a hard and mature lauki you better make a raita. This lau-er shukto recipe looked delicious when I first saw it on a Bengali recipe forum on facebook. So much so that I cooked it almost the next day and was so delighted by the delicate taste of this curry that I ate the entire potful all by myself. The recipe was shared by Dipta Maitra and I have made minor adjustments to suit my taste. He jokingly accused me of harassing the recipe when I suggested I might add paneer to make it a complete meal for myself. I wouldn't mind this punjabification of shukto you see. According to the discussion about shukto on the Bengali recipe forum, shukto is a curry that includes some bitter taste like karela, bramhi leaves or methi seeds, some ginger paste added in the last and some green chillies. Never to add red chillies and turmeric powder to shukto I learned. I am not complaining. Peel and cube the gourd in large sized cubes. Add the lauki cubes in a pan (kadhai) along with 1/2 cup of water and salt and cook on low flame for about 10 minutes. Add the milk and cook on medium heat till the vegetable is cooked well. Now heat the ghee in a ladle and tip in the fenugreek seeds in it. Let the fenugreek seeds get browned and aromatic and pour this hot mix into the cooking curry. Next to add is the broken chillies and ginger paste. Mix well and simmer for a couple of minutes. Finish with roasted mustard powder and serve immediately. This subzi would tempt you to consume more vegetables in a tastier way. So go ahead and cook some lau-er shukto for yourself now. The best suitable accompaniment to this lau-er shukto is plain boiled rice. I tried this milky lau-er shukto without the roasted mustard powder too and liked it both ways. The interesting thing is, as much as I loved this delicately flavoured milky lau-er shukto, Arvind refused to taste a milky curry as he thought he wont like it. His loss completely. There is very mild bitterness of methi in this delicate curry and that tastes really interesting. Ginger imparts a lovely depth and roasted mustard powder was a surprise for me in this milk based curry. I actually added more milk than usual and loved the way milk incorporated the flavours of the frugal spices. May be Arvind would also come around to some lau-er shukto next time I cook this as I am going to repeat this many times now. I even tried it with tinda (apple gourd) but it was not as good as the lauki version. I will keep making the original version of lau-er shukto for sure.